She's Fantastic: Gremlins Mogwai PENNY! Sorry for the lack of posts lately! I just moved and my priorities are completely shuffled around. All my toys are packed (but itching to be put out on brand new shelves) and I don't even have internet yet. I was uncertain when I would be able to post again but it's always on my mind. It's amazing how much I've missed reviewing toys the past few weeks. Luckily I developed a new obsession which inspired me to spend an evening in my old apartment (where I still have keys - and internet) and write this quick review. Gremlins was a smash hit in 1984. I was both in love with and terrified of this movie. Most all all I remember desperately wanting a pet Mogwai like Gizmo (I think it goes hand-in-hand with my Ewok obsession). Then Gremlins 2 came out in 1990 and I just loved it. I was older so the Gremlins didn't bother me in the least, plus I realized the movies were a great mix of silly and scary. 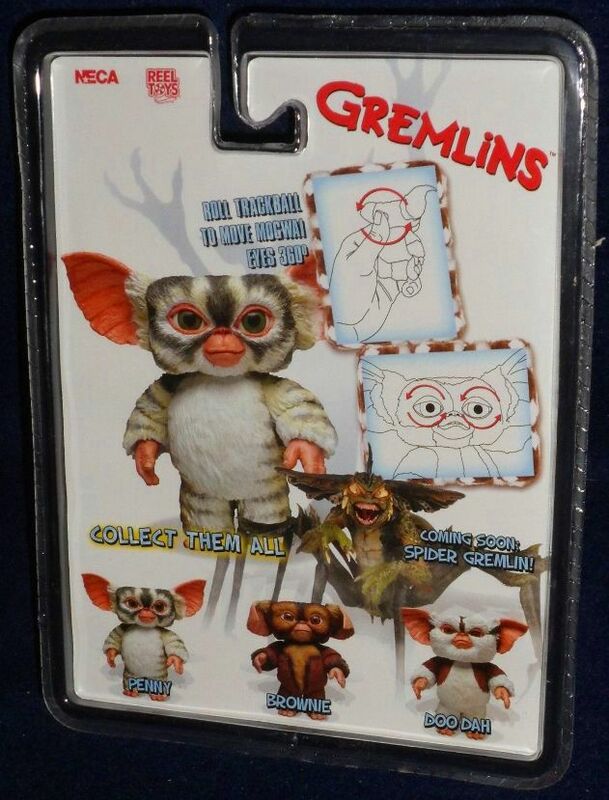 NECA has been producing an amazing line of Gremlins toys for the past few years. Penny is the first girl and my first purchase from the line, but definitely not my last. (I ordered three more already) Let's check her out below! 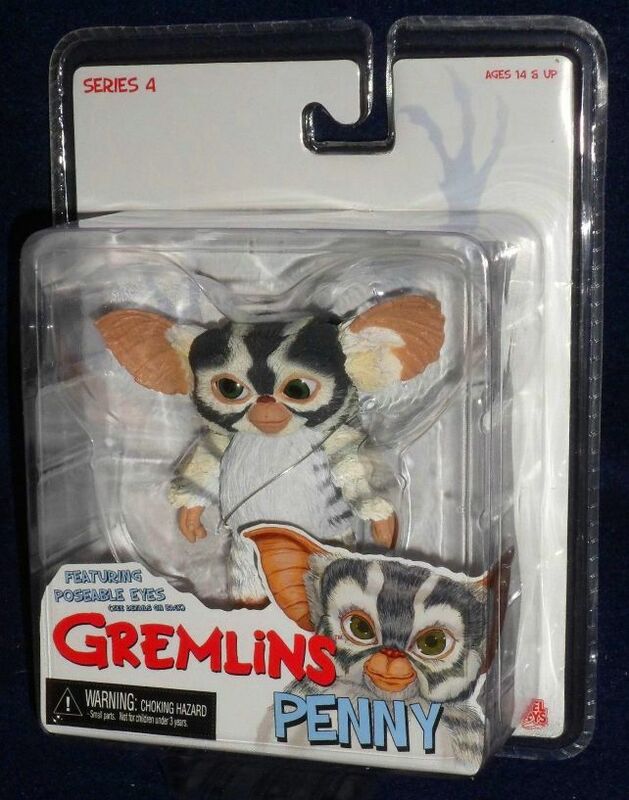 FYI: This line is actually NECA's second Gremlins line which began in 2011 and is based off of Gremlins 2: The New Batch (which had a lot more characters with a lot more personality traits). Penny and her fellow Mogwai from Series 4, Brownie and Doo Dah, are actually characters that were created for Gremlins 2 but never made it into the movie. I die for nerdy stuff like this. I am a proud owner of an unknown female Mogwai and I'm just giddy about it. These packaging pics are swiped from eBay because I couldn't resist opening her as soon as I bought her... plus I had no clue where I had packed my camera so for all I knew this review wasn't going to happen for months. This figure is perfect to me. It so perfectly embodies the cuteness I loved about the Mogwai combined with the weird fantasy creature look that made them a little eerie at the same time. 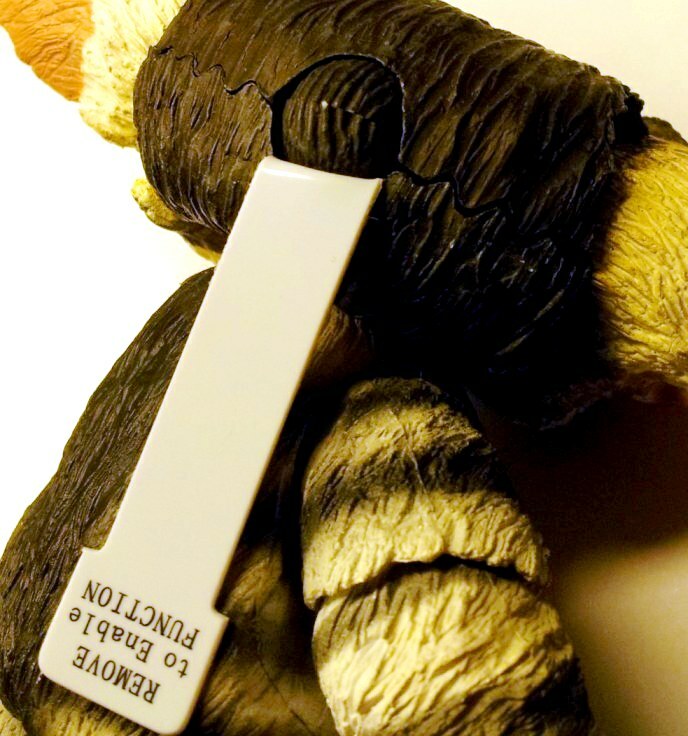 The coolest feature that all the Mogwai figures have is articulated eyes that are controlled with a rollerball on the back of their heads. The expressions you can give them are endless. The other articulation is amazing, too. Elbows, wrists, shoulders, neck, legs, and ears are all fully articulated. I have been watching this line closely as I loved the Gremlins movies. I decided to wait & see if they made Greta the gremlin before I jumped in. When she was finally shown I was stoked, & the proto certainly looked awesome. But it seems uncertain still if she will ever be released. It is great to see they were able to get a female mogwai in the line! she is very cute. I'm intrigued by the Greta figure. I don't think I'll be able to resist getting it, but I can't stand the rooted hair. It's interesting though because I already ordered one Mogwai with a rooted tuft of hair (Spike) and I will eventually be getting Mohawk.. so maybe this line will just be a huge exception. I pick and choose what I like about each franchise. I love the Mogwai, but am only so-so about the actual Gremlins. I didn't even know there were Goonies toys out there. ghostbuster was a little "meh" for me, but I got into certain parts of it.